How about we get to my card for today? 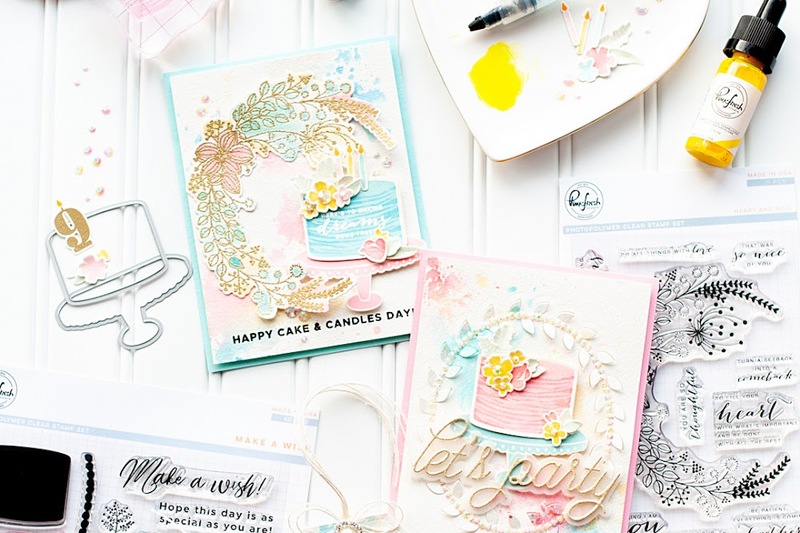 I used some SugarPea Designs goodies to create my card, and they will all be linked at the end of this post. I've been making missing you themed cards a lot lately...I think I just miss my family all the way over in Montana. So, my eyes tend to be drawn towards these kinds of sentiments...and I just love this latte themed one that I used today! To start, I created an A2 card from white cardstock and set aside. Then I diecut the Large Striped CoverPlate from white cardstock and set it aside as well. Then I proceeded to blend oxide ink in Tattered Rose & Delicata ink in Golden Glitz together to another white cardstock block. 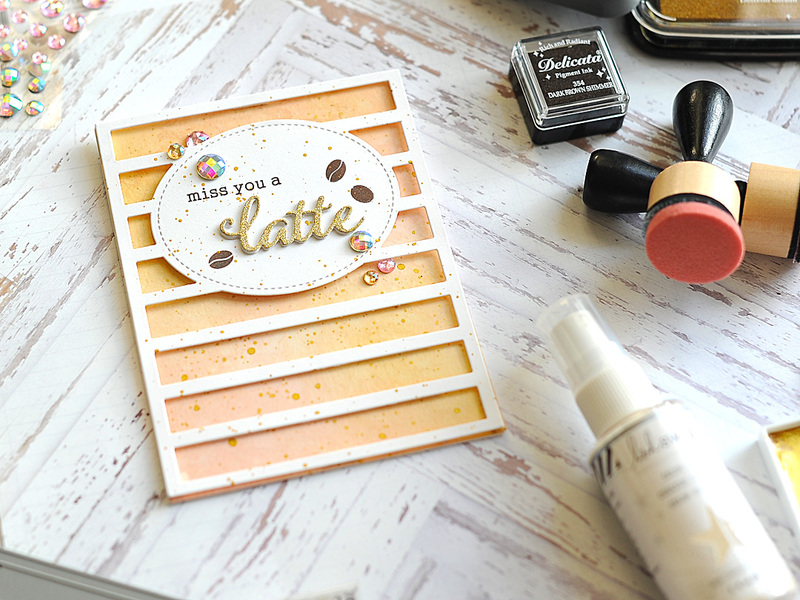 Once blended, I spritzed with white shimmer spray, then flicked gold paint splatters to the front of it and the striped CoverPlate diecut. 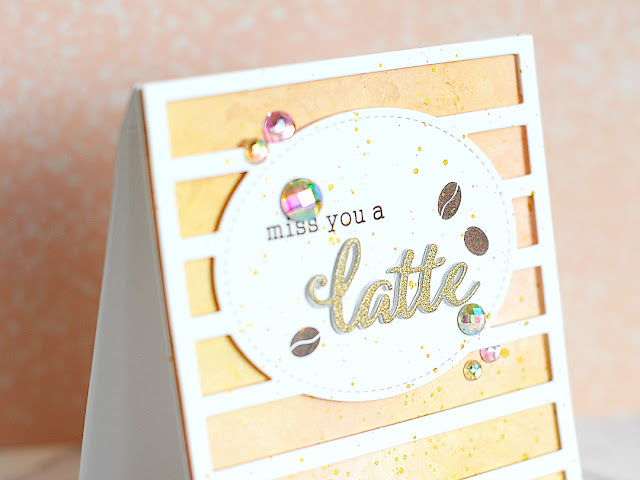 Next I diecut the word latte four times: once from gold glitter paper and three times from white cardstock. 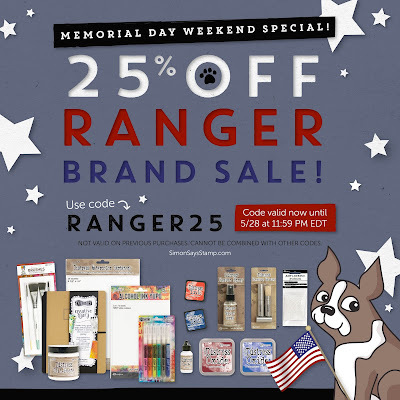 I layered them together with a Zig glue pen, then adhered to the striped diecut. 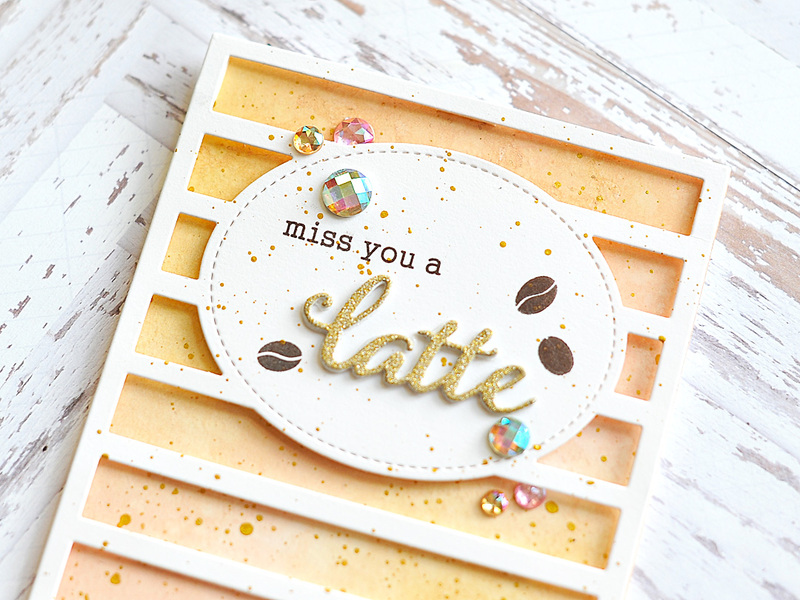 Next I stamped the coffee beans, and the rest of the sentiment to the front using my MISTI. Then I adhered the ink blended background directly to the card front. Next I popped the Large Striped CoverPlate diecut to the front using foam tape. You have to trim the pieces quite skinny, but it is worth it to have that extra dimension! Then the final step was accenting it with my signature jewels tucked here & there. Between the Delicata Golden Glitz ink & the Zig gold paint splatters, my card is super shimmery & glitzy. It doesn't photograph super well, but you can kind of see it in this shot. 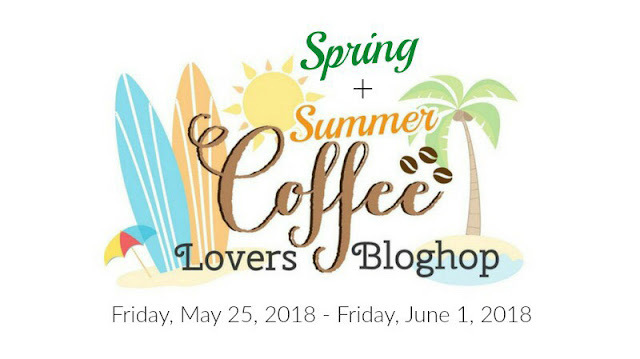 Before you move along and check out the blog hop, I wanted to invite you to follow me on social media. I hang out on Instagram a lot, and share my work in progress in my stories...along with REALLY cute photos of my dogs! :) Plus, I just started a YouTube channel, and while there are only a few videos right now...I will be adding new content consistently! I really like this background die-cut panel. Lea . 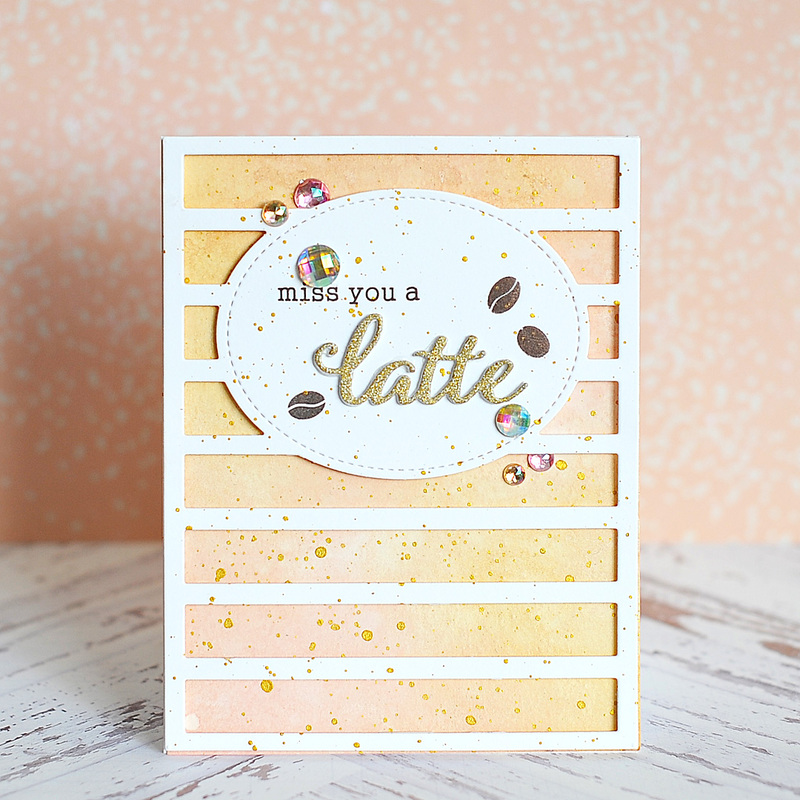 Your coffee card is adorable. 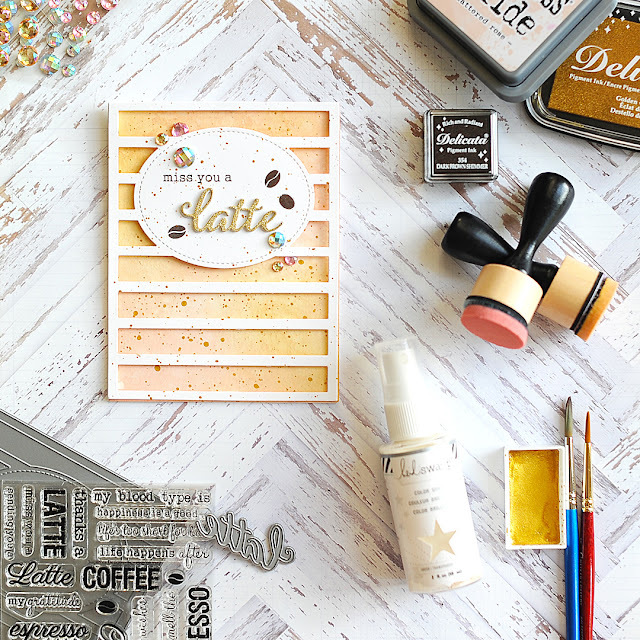 love the splatter background and the bling. 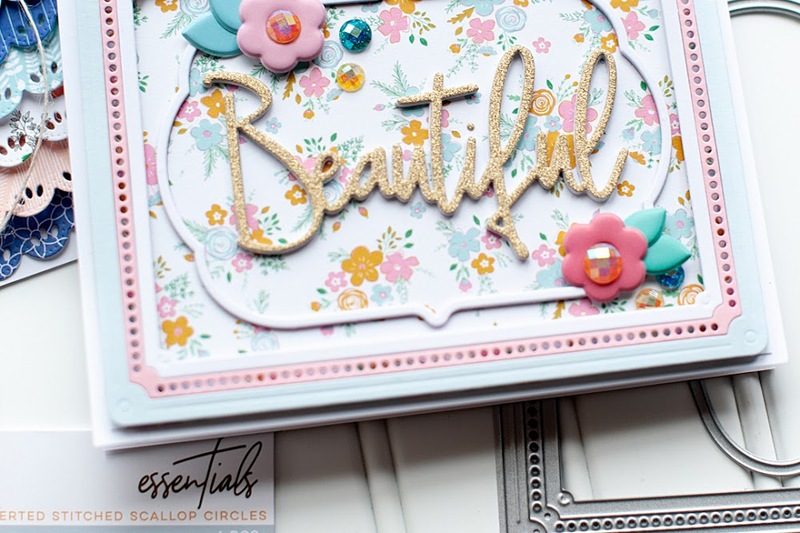 Gorgeous card!! I love the way you popped up the striped coverplate, and I love the colors you used as well! So gorgeous with focusing on the sentiment with cute die! Such a gorgeous and elegant card! 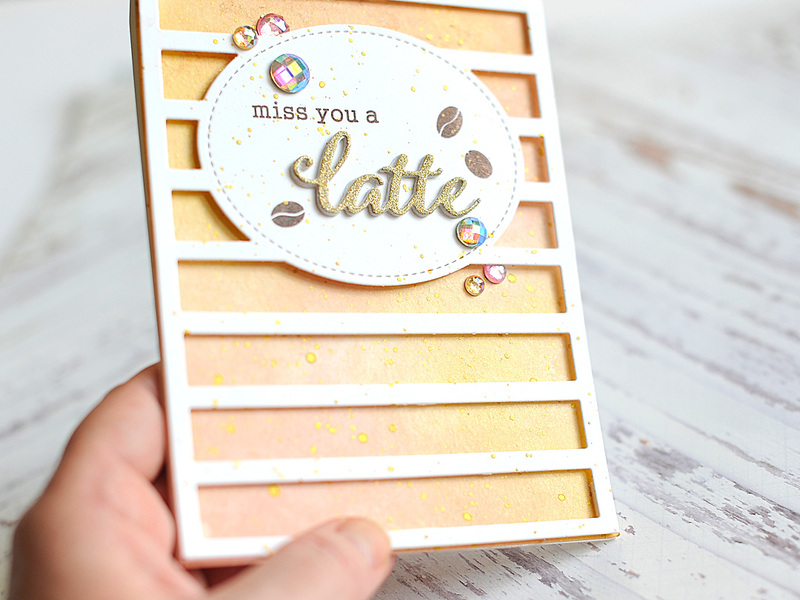 Love the colors, the way the sentiment is embossed and the gorgeous layout! SO fabulous!!! Great photos too! wow! its so very pretty card! Lea your coffee card is gorgeous! 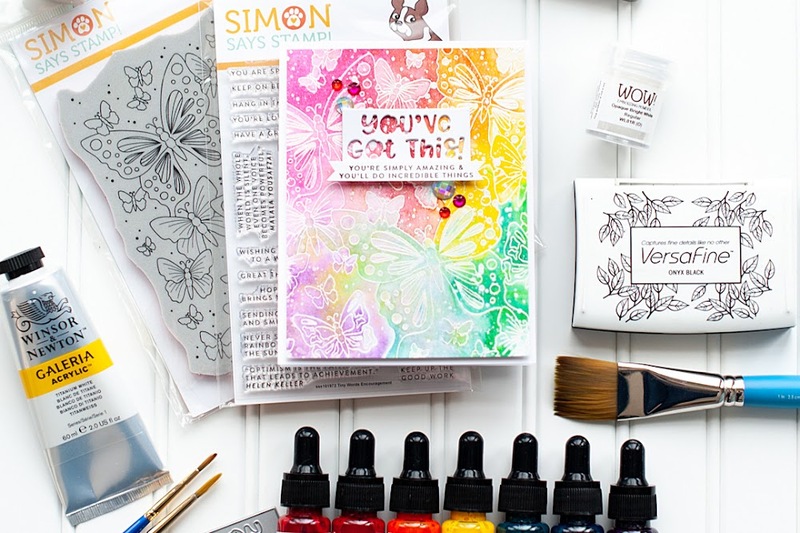 I love the colors and the splatters! So pretty. I like the striped background. So very gorgeous and I love the die cover plate used on it. So pretty. The Latte is awesome. Love your colors . This is so gorgeous. While I don't drink coffee, I love tea and I love coffee and tea themed anything! We have an amazing little coffee shop around the corner that is owned and run by some young 20 somethings - I love to support them! Lea, thank you so much for playing along! 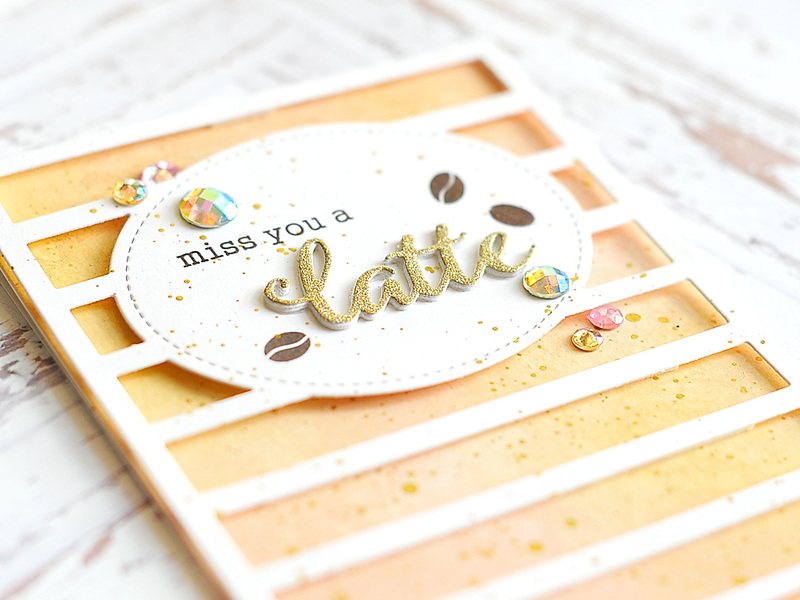 Your card is so pretty, I always love your choice of colors and details. So so pretty! Love the soft golden glow! Perfect! 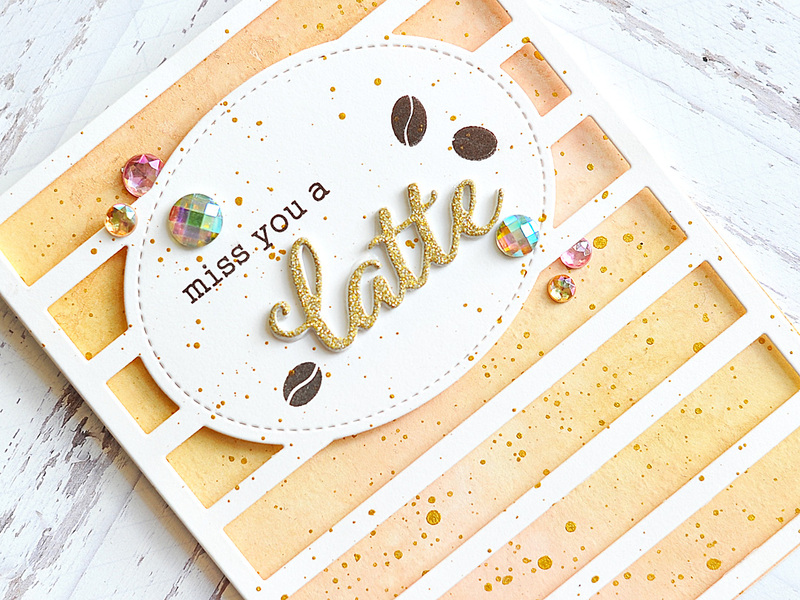 I love your pink and golds, I love your jewels and I do love your card ! Pretty! Love the soft colors and the design is just so beautiful! Wow! As always, your colouring technique is amazing! Stunning card!!! Great card. I really like the clean and simple look. It's so summery and sparkly! 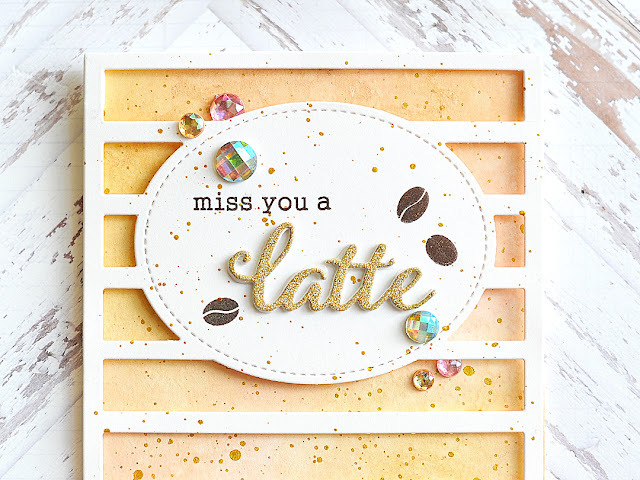 I love the cheeriness of it, even if the sentiment is a "miss you" sentiment. It's so optimistic.